Over the last two months I’ve been helping piece together a picture of water use on the Middle Fork of the Popo Agie River. Water from the Middle Fork irrigates some 11,500 acres of agricultural land in the region around Lander, Wyoming. These diversions support a strong agricultural economy and aesthetic (the working ranches, hay pastures and livestock that define the outskirts of Lander, and which have been lost around so many other towns in the West), as well as extensive irrigation-dependent wetlands and riparian areas. Additionally, the river provides all of Lander’s drinking water, and the Middle Fork and its tributaries run straight through town, providing a scenic and recreational centerpiece for City Park, Main Street, several riverside trails, and dozens of backyards. At certain times and places every year, the river shows signs of being overworked. In May and June, water availability (the blue line in the graph below) far exceeds irrigation demand (shown in red). As snowmelt dwindles in the late summer months, thirsty hay fields need most of the water that comes off the mountains, leaving only a trickle to run through town (in green). Low flows reduce the river’s capacity to dilute bacterial (E. coli) contamination flowing from upstream, sometimes making contact recreation unsafe. 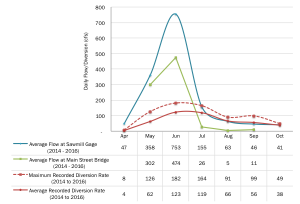 The community has already taken several steps to solve the problems created by low flows. For example, repairing leaking septic tanks and fencing off riparian areas have kept bacteria levels in the river from exceeding safety standards for several years running (for comparison, 14 out of the 15 of the previous years required safety warnings in City Park). The local Trout Unlimited chapter has also worked to adapt the river to low flow conditions by digging deep pools and adding boulders to create cold-water refuges for fish. However, the fundamental problem of there being too little water to satisfy all demands remains unsolved. To this end, the Healthy River Initiative, a coalition of local organizations and community interests formed to address the dual problems of water quantity and water quality on the Middle Fork. The Healthy River Initiative has pledged to “bring water users together to identify, develop and implement voluntary measures and best management practices for managing water during low flows in ways that honor existing water rights”. Timely and accessible information about when, where and how water is used in the watershed (like the chart above) will hopefully help move the conversation forward and enable the community to develop locally-tailored solutions. Back on the ground at Red Canyon, I’ve been updating long-term photo monitoring points in the upper reaches of Cherry Creek. The points were established in 1995 and were most recently updated in 2003. 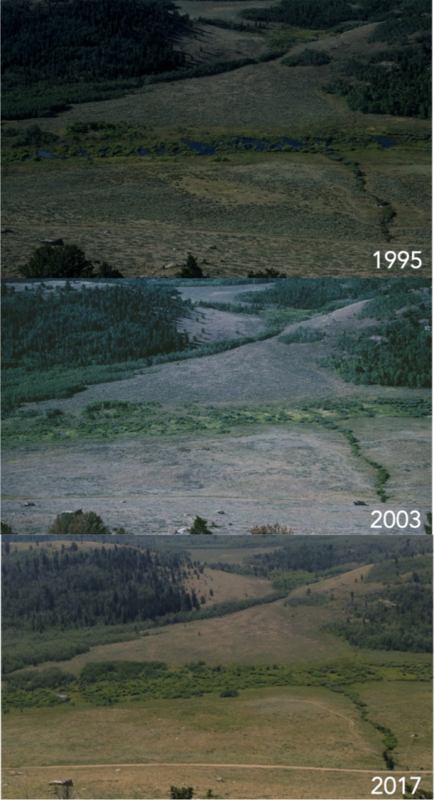 The 20-year succession of photos (1995 to 2017) tells a story of vegetation change driven by fire, wildlife, disease and water availability. For example, beaver ponds visible in 1995 have filled in and become wet meadows, stands of mature aspen have died back and – thankfully – resprouted in dense thickets, and a wildfire in 2001 scorched through pines and sagebrush. This entry was posted in Water, Western Research Fellows, Western Resource Fellows, Wildlife, WRF 2017 and tagged Austin Rempel. Bookmark the permalink.